Applicants must be between the ages of 18 & 26, and a citizen of Antigua and Barbuda. 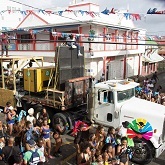 Check out the safety tips for Antigua Carnival. 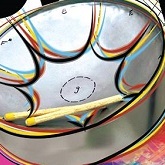 Commencing promptly at 2pm on Saturday 21st, the city will come alive with sweet steel pan music. 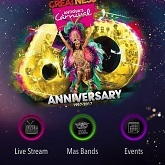 Watch all the fetes and biggest street parties live during Antigua 60th Carnival by downloading the App for Android, Iphone and Windows. 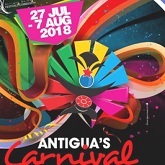 Check out the schedule of events for Antigua 60th Carnival which kicks off with the Iron Band Competition on July 27th and ends on August 8th. The first six delegates have been named and their pictures released for the 56th Miss Jaycees Queen show on Sunday, July 30th. Check out the results for Carnival Monday and Tuesday winners of Band of the Year, King & Queen of the Band, J'ouvert and Mas troupes and more. Check out the routes and assembly points for the parades such as J'ouvert morning, Parade of the Bands and Last Lap. 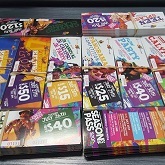 View the outlets where you can purchase tickets for the Carnival events such as the Party Monarch and Soca Monarch competitions. See the semi-finalists in the Groovy and Jumpy categories of FLOW Party Monarch competition which was held on June 27 & June 28th. Individuals desirous of becoming a Pan Competition Adjudicator can sharpen their skills during a two day workshop set over June 24th - June 25th. On October 17, in the Conference Room at the Sir Vivian Richards Cricket Stadium. Antigua and Barbuda Festivals Commission promotes Antigua’s 60th Carnival during 2015 Labour Celebration in New York. The official results for Antigua Carnival 2015 announced by the Antigua and Barbuda Festivals Commission. Floats, Band of the Year, Road March, Jumpy and Groovy Monarchs, Panorama. 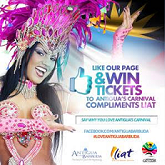 Win a trip to Antigua and Barbuda for the Caribbean's Greatest Summer Festival being held from July 25 – August 4 2015. The ACB Panorama Competition is on Friday 31st July, at Carnival City beginning at 9:00 pm. 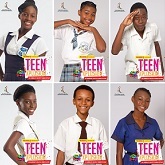 Twelve teens from secondary schools across the country to compete in the Teen Xplosion competition. Kennedy’s Club Ltd. will be the first corporate entity to join the TOP Partner Program. Antigua Recreation Grounds officially handed over to commence the transformation into Carnival City. Jam with Angel's J'ouvert troupe on Monday, 3rd August 2015 at 4:00 am. 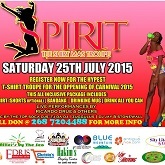 Sign up now for Spirit T-shirt Mas troupe and jam with them on Saturday, 25th July 2015. The Hadeed Motors Miss Antigua Barbuda Pageant 2015 will be held on Friday, 26th June at the Sir Vivian Richards Stadium at 8:00 pm. 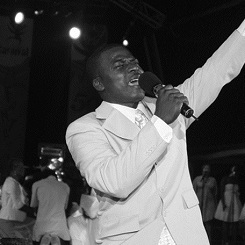 Quarter and Semi-Finals dates for prospective Party and Calypso Monarch artistes. 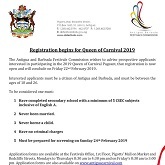 The general public is advised that registration for Antigua’s Carnival 2015, “The Caribbean’s Greatest Summer Festival”, is currently still ongoing. Preparations for the inaugural Miss Antigua Barbuda Pageant are currently underway with the release of ticket information for the upcoming show. 2015 Teen Xplosion, formerly “Teen splash”, Competition Subcommittee Chairman, Vinema Jarvis, says this year’s show promises to be one with a difference as the Antigua Barbuda Festivals Commission get set to mark the 59th anniversary of the Caribbean’s Greatest Summer festival next year. Join Angel's J'ouvert troupe for the best Jump up street party experience on Monday 3rd August 2015 from 4am. The Antigua and Barbuda Festivals Commission is urging females across the country who are interested in vying for the title of the first ever Miss Antigua Barbuda to register. Registration for Antigua’s Carnival 2015, “The Caribbean’s Greatest Summer Festival”, has officially begun. 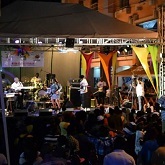 In front of a large crowd, The Antigua and Barbuda Festivals Commission under the Ministry of Trade, Industry, Commerce, Sports, Culture & National Festivals, launched the 2015 Carnival festivities on Saturday on Redcliffe Street. Spirit tee shirt mas & Angels J’ouvert Troupe is a fundraising Carnival troupe with the profits from the troupe going to Colin Richards’ medical fund. A call is being made on residents who are interested in the Carnival Volunteer Program to register at the office of the Antigua and Barbuda Festivals Commission. The Carnival Committee has announced the 10 finalists for the Calypso Monarch Finals to be held on Sunday, August 3 at Carnival City. See the semi-finalists who will compete on July 21st for a spot on the stage. The registration deadline for applicants of all disciplines of Carnival is Thursday June 26, 2014. The Carnival Development Committee and The National Festivals Office wish to remind all concerned that registration for all competitions for Carnival 2014 is ongoing. Check out the results for the 2013 Jaycees Queen Pageant right here. Patrons of the Angels J'Ouvert Troupe for Antigua Carnival this year will be in for a treat, with a great package, fantastic entertainment and a guaranteed good time for all. Myst Carnival takes to the street on the opening day of Carnival, July 28th, in 'prep'aration for Carnival Monday and Tuesday. Several big stars of soca, along with a few newcomers, made it to the semi-finals last week with the close of the Party Monarch quarterfinals. "Lunch Time Calypso" at Wadadli Beer Calypso Corner, located at the junction of High Street and Corn Alley, is back. Kennedy's Club Limited has just "up the ante" in respect of their already heavy involvement in Antigua & Barbuda's summer festival. The Carnival Development Committee – CDC wishes to inform the general public that registration has commenced for all disciplines of Carnival. Check out the 2013 Myst Carnival calendar. Angels J’ouvert Troupe, a product of Antigua Party People, is a fundraising troupe with the profits going to Colin Richards’ medical fund. At present they are in the process of organizing the 3rd Annual Angels J’ouvert Troupe for one of the highlights of Antigua’s Carnival, J’ouvert morning, set for Monday 5th August , 2013, from 4am to 10 am. 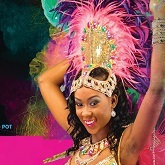 Check out Antigua Carnival 2012 Band of the Year Results and Road March Title. 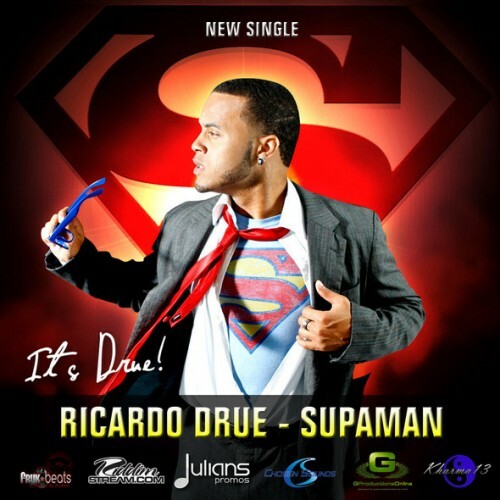 MEET THE GROOVY-JUMPY SOCA MONARCH 2012 KING! After a splendid series of live performances on Saturday evening, the results were in and for the first time, Antigua’s Groovy and Jumpy King Soca Monarch was hailed Tian Winter! Miss Dominica, Nadira Lando takes the 51st Jaycees Crown. Yesterday marked the end of the 11-day journey of called Antigua Carnival 2012, In Living Colour. It was a tight competition but Antigua Grammar School's own Winston Pheonix made the biggest splash at this year's Teen Splash Competition. Attention all jouvert troupes, here is a special announcement from the CDC. Get your Carnival costumes, now. Carnival 2012 continued with the Queen of Carnival Pageant last night at the Antigua Recreation Grounds. The results released by the Carnival Development Committee (CDC) are listed here. A very impressed chairman of the Carnival Development Committee, Kayode O'Marde, congratulated and believes that the finals will prove to be one of the more recent, better competitions. As Carnival 2k12 comes to an end make sure you leave this season with the hottest music! DESTINATION DADLI II: the brand new, second edition, CD compilation is all yours as of Thursday, August 2nd. The route for this year’s J’Ouvert celebration has been altered. Presentation on bullying in schools helped 11-year-old Destiny Martin of Bolans Primary School win the 2012 Optimist Petit title. Queen of Carnival contestant Miss Tenisha Sebastian shares her emotional experience at Amazing Grace Children's Hospital. Carnival Development Committee Parade Routes for 2012. The Carnival Development Committee wishes to advise the general public of the NEW dates for the 2012 Wadadli Beer Calypso Monarch Quarterfinals slated for Friday 13, Saturday 14 and Sunday 15 July. Are you young, vibrant and friendly with an outgoing personality? Well, Beautiful People is looking for you. Starting July 16th, visit our facebook page at noon for a chance to win tickets. Angel's Jouvert Troupe has put together a package for J'ouvert morning for Carnival 2012. The 2012 contestants will be partnering with the Care Project, home to children with special needs at the Holberton Hospital, as part of their charity for this year. The Carnival Development Committee wishes to inform ALL Jam Bands that we are conducting registrations until Friday June 29, 2012. 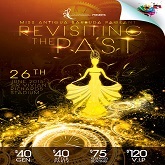 Get the latest event information for Fantasy 268 Mas Troupe here! Leggz reloads in extraordinary fashion by bringing one of the biggest names in dancehall to meet the brightest stars in the soca business in a fete that is destined to go down as one to be remembered for a long time. The Carnival Development Committee (CDC) is pleased to advise of the commencement of a series of Calypso Adjudicators Workshops. This series of workshops is extended to ALL persons desirous of becoming Calypso Competition Adjudicators. 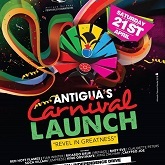 The Carnival Development Committee (CDC) is confirming that there will be no public launch of carnival this year. Antigua and Barbuda Queen of Carnival, Latisha Greene has completed a visit to Germany, fulfilling one of her final duties as the 2011-2012 reigning Queen of Carnival. Tenisha Sebastian, Alana Michael, Kimberly King, Daveile Payne Abbott, Ranee Laronde and Andrena Athill are the six delegates who will be vying for the Queen of Carnival crown this year in a show, which will be guided by the theme, Unleash Your Creativity. A Grecian Temple, yep, in Antigua, that is what Beautiful People call their mas camp for carnival 2012. The Carnival Development Committee invites Tenders for the provision of the following equipment and services for Carnival 2012. The Carnival Development Committee wishes to remind stakeholders that registration for the various competitions for Carnival 2012 is open. 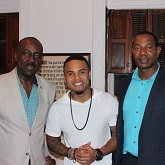 Artistes registering for the first time are asked to present proof of Citizenship of Antigua and Barbuda. Organisers seek to find innovative ways of minimizing expenses while delivering a remarkable product for Caribana 2012.
â€œDecisions are being made and it is just for the CDC-appointed committee to be in place. Carnival this year will run from July 28 to August 7 and I can promise you that this Carnival will be better than last year and previous years. 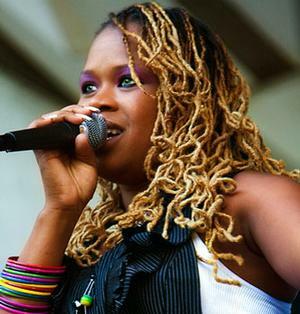 Soca Diva Claudettte “CP” Peters Dance Auditions will take place on Friday 10th February 2012 at 6pm. Carnival organisers will this year scrap the Carnival Melting Pot show and replace it with a Caribbean soca monarch competition. 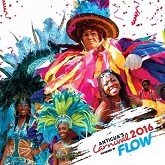 A brand new CD compilation featuring 15 blazing HOTT tracks from Antigua's Carnival 2011!!! SIGN UP TODAY WITH A J'OUVERT TROUPE! Check out the different troupes available for this years J'ouvert jam. Tickets will be on sale at various outlets around St.Johns. The official start of carnival might be scheduled for next Wednesday in Antigua, but one wouldnâ€™t be able to tell that easily. BEAUTIFUL PEOPLE MAS BAND COSTUMES - REGISTER TODAY! The Queen of Carnival Competition is the first staged pageant of Carnival, being held this year on July 26th. This show has maintained true to the core principles, however we have witnessed new innovative segments introduced to keep up with the times and enhance the overall production. Anticipated to be one of the biggest and hottest shows for Antigua Carnival, the artistes participating in the LIME Jumpy and Groovy Party Monarch competition are being given the star treatment. The Carnival Development Committee has released the order of appearance for the artistes participating in the Lime Party Monarch competition. WHO WILL BE THE NEXT JAYCEES CARIBBEAN QUEEN? The final set of Sponsorship Press Conference Series dates and venues for this week. The Carnival Development Committee (CDC) has expressed its profound gratitude to Antigua Commercial Bank, the country's first indigenous commercial bank, for once again sponsoring the Panorama competition. 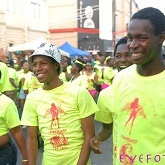 The staging of the quarterfinals in the Lime Party and Groovy Monarch competition will begin on Monday. By winning both the Party and Groovy Soca Monarch Competitions in 2009, Tian Winter enters the 2010 Carnival season with great expectations resting upon his shoulders. Can't make it to the party, or even worse, no chance as it's a plane ride to get here, don't worry, check into our live feed and you won't miss out. The Revellers Mas Troupe in celebration of our 35th Anniversary of Mas is having a grand raffle. Tickets on Sale for Solid International Band Launch. 2010 CARNIVAL REGISTRATION FORMS ARE READY!!!! Registration Forms are available at the NFO during business hours (Mondays to Thursdays 8:00 am to 4:30 pm and on Fridays 8:00 am to 3:00pm.